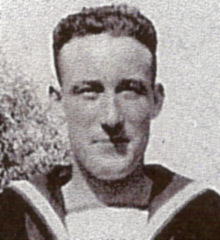 Able Seaman John McGuckin, was born on 23rd Feb 1914 and was the son of Michael McGuckin, Ballinderry Bridge, Cookstown. Prior to joining the Navy he was serving his apprenticeship as a tailor. He died whilst serving on H.M.S. Jupiter on 27th February 1942. During the battle of the Java Sea the ship struck a mine and sank shortly afterwards.